Horno de Asar, oven for roasting, part of the famous murals of La Chata restaurant on Cava Baja, old quarter of Madrid. Photograph by Gerry Dawes©2009. Contact: gerrydawes@aol.com / Facebook / Twitter. 17th Street Bar & Grill / Memphis Championship Barbecue's Mike Mills "The Legend" with Gerry Dawes at the Big Apple BBQ Block Party 2012. Photo by Kay Balun©2012 / gerrydawes@aol.com. Day 00 Thursday, Feb. 1, 2015 - Flight to Madrid from gateway cities. Arrive in Madrid, Spain’s capital, where we will rendezvous at our hotel, which will be near the Prado Museum. We will allow everyone to freshen up, then we will meet at 2 p.m. for a short optional tapas tour of the area near our hotel. In the afternoon, there will be free time for siestas, shopping or touring. In the evening, we will eat cochinillo asado, roast suckling pig and/or roast suckling lamb in the world’s oldest continually operating restaurant (Hemingway wrote about it). Cochinillo asado, roast suckling pig, specialty of the house at Casa Botín, an old Hemingway hangout where a major scene in The Sun Also Rises was set, on calle Cuchilleros, old quarter of Madrid. In Madrid, we will also visit the Prado Museum and other sights, have time for shopping and getting over jet lag, get our first introduction to jamón Ibérico, the world’s best hams from acorn-fed, pata negra (black foot breed) pigs; to a wide variety of tapas (small plate specialties); and to some of the best shellfish in the world, not to mention a couple of egg and potato dishes that may soon become staples on some of your menus back home. Cutting jamón Ibérico at Mas Gourmets, El Mercado de San Miguel. From Madrid, we will go to Segovia, the roast suckling pig capital of Spain and home to an amazing 2,000-year old Roman aqueduct that still crosses the city. For lunch, we will have exceptional roast suckling pig, so tender they cut it with the edge of a plate, in a restaurant that has been a must visit for celebrities and just plain folks for decades. Segovia, Mesón de Cándido, a major roast suckling pig restaurant alongside the Roman Aqueduct. After lunch we will visit the amazing Medieval walled town of Ávila, stop off to see one of Spain’s greatest jamón Ibérico ham cutters–he travels the world showing how these hams should be cut–and sample his hams. We will spend the night in Ávila and dine on this city's version of roast suckling pig. Before lunch, we will head south through the major pig town of Guijuelo, where we will stop to visit one of Spain’s top jamón Ibérico producers, sample some primo jamón and sausages, then travel south to the monumental medieval city of Cáceres, where we will have lunch and sample the sensational local Torta del Casar cheeses. After lunch, we will tour the old quarter, then move on to nearby Trujillo to spend the night. The hilltop town of Trujillo, hometown of Pizarro (conqueror of the Incas) and Orellana (the first European to make the 2400-mile trip down the Amazon), has a major cheese fair every year in May and producers here make great goat cheeses, including Ibores. Here we will take a break from pig, have some roast goat and try other regional dishes and Extremaduran cheeses. 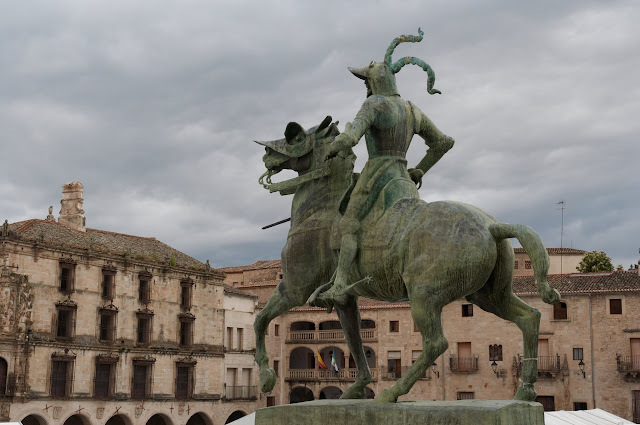 Equestrian statute of Francisco Pizarro, conqueror of the Incas, in the Plaza Mayor of Trujillo, Extremadura. What an exciting day we have in front of us! After a walk around picturesque Trujillo, the next stop is Montánchez, an incredible hilltop town, where we will sample the prime hams, including some of the best in Spain, from this village and visit a hermitage with stunning views. Iberian pata negra pigs, the ones used for Ibérico Jamones de Bellota, foraging for bellotas (acorns) near Montánchez (Cáceres). Photo by Gerry Dawes©2013 / gerrydawes@aol.com / http://www.gerrydawesspain.com Canon 5D Mark III / Canon 70 200mm f/4L USM with Canon 1.4 Telextender. Depiction of a Roman centurion with a ham in Mérida, which has the most important collection of Roman monuments in Spain and is at the center of pig products in Spain's western provinces. We will stay in the Parador de Mérida, in a renovated convent, just a couple of blocks from the main square (excellent evening lollygagging territory) and within an easy stroll of all the major Roman ruins. This afternoon will be free to relax, tour the Roman monuments, stroll across the river on a pedestrian-only Roman bridge and take the evening off. Mérida’s Roman bridge, mirrored by a modern bridge designed by Santiago Calatrava, spanning the Guadiana River. Mérida has the most important Roman monuments in Spain. We will leave Merida in the morning, stopping off for a short visit to Jerez de los Caballeros, the evocative and picturesque hometown of Vasco Nuñez de Balboa (discoverer of the Pacific Ocean) and De Soto (explorer of the Mississippi River). By lunchtime, we will arrive in Jabugo, the jamón Ibérico capital of the Andalucía. We will tour a jamón processing plant and have lunch in a picturesque nearby village with local specialties and some of the best pig products in the world. Employees at Consorcio de Jabugo checking the jamones Ibéricos de bellota (hams from acorn-fed Ibérico pigs) curing in their plant. Julio Revilla, President of Consorcio de Jabugo, jamón Ibérico de bellota producers, at his stand at the Madrid Fusión gastronomic conference. ("Signature Jabugo hams. The Ibérico (pig), a singular breed. A place with a unique climate, Jabugo. And special treatment, the arte of Ibérico Ham Maestros.") Photo: Gerry Dawes©2011 / gerrydawes@aol.com. After lunch, we will arrive in Sevilla, the city of Carmen and one of the most beautiful and evocative cities in Europe. After checking into our hotel, we can relax until early evening when I will lead a walking tour of this stunningly pretty city where Gerry Dawes lived for nearly six years. We will sample tapas in a few places, then sit down in a particularly good tapas bar for some grilled shrimp and other special tapas, including, no doubt, a plate or two of Ibérico ham. La Giralda, the former minaret of the Moorish mosque, now the bell tower of Sevilla's cathedral. After the tapas tour, we go with some native Sevillanos to an authentic flamenco joint. In the morning, we will have a guided tour of the Cathedral and the Moorish fortress-palace El Alcázar, do some strolling and shopping, then travel south to the superb fishing and wine town of Sanlúcar de Barrameda, where Columbus set sail on his second voyage to America. We will prevail upon one of my friends to open his 200-year old sherry bodega and let us taste some of his exceptional manzanilla sherries, then we will have lunch at a beachfront restaurant with more manzanilla, grilled shellfish and some of the best fried fish in the world. Javier Hidalgo, one of the Directors of Bodegas Hidalgo La Gitana,Sanlúcar de Barrameda. Hopefully, we will see one of Sanlucar's spectacular sunsets from the legendary Bajo de Guia fisherman's beach with a glass of manzanilla in hand (more on this later). Afterwards, we’ll return to Sevilla in the early evening to relax. Those still game can go with me for an optional tapas crawl of the old city's famous taverns. We will leave Sevilla in the morning and head for Córdoba, where we will visit the old quarter and tour the Mezquita-- once one of the great Mosques in the world, so huge that it has the Christian full-sized cathedral built into the middle of it. The Mihrab in Córdoba's Mezquita (former mosque during the Moorish occupation of Spain). Photo: Gerry Dawes©2013 / gerrydawes@aol.com. We will tour the labyrinthine streets of the old quarter, one of Spain’s finest, stopping at a special Córdoban taberna, where the berenjenas fritas (fried eggplant) may also end up on your home menus, along with salmorejo (a thick kind of gazpacho that is at its best here). We will then travel north less than an hour to visit the great up-and-coming jamón Ibérico region of Pedroches, tour a ham-curing operation and see the Ibérico pata negra (black foot breed) pigs grazing on acorns in the picturesque countryside and have lunch with the producers. Salmorejo with chopped jamón Ibérico and egg at Taberna Juan Peña, Córdoba. After lunch, we will drive across La Mancha, land of Don Quixote, stop to see some of the famous windmills and arrive in the early evening in the historic city of Toledo, where the following day our barbecue stars will exhibit their cooking skills for the Spanish press and gastronomic luminaries in a spectacular location overlooking Toledo. Some of our lucky barbecue esperts will go to Chef-owner Adolfo Muñoz's (Restaurante Adolfo) cigarral country house (a couple of miles) overlooking Toledo and the Alcazar and get the pig smoking for tomorrow's event and leave a couple of crew, along with Adolfo's crew, to keep things going. You will be supplied with plenty of beer, vino, food and probably a bed. The rest of the group will have dinner in Toledo at one of Adolfo's restaurants. 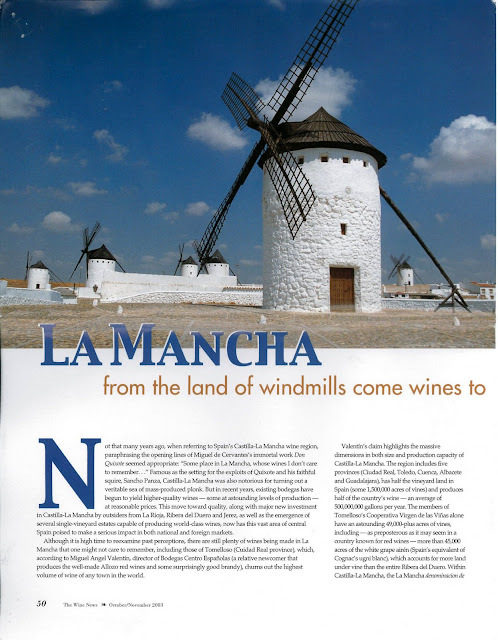 La Mancha, text and photos by Gerry Dawes, The Wine News. 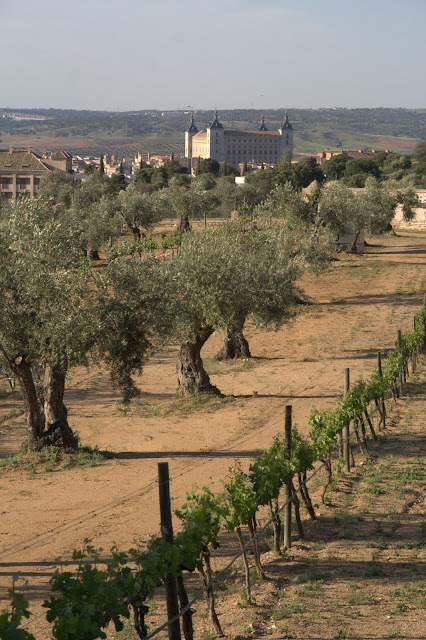 Chef-owner Adolfo Muñoz's (Restaurante Adolfo) Ama vineyards at his cigarral country house overlooking Toledo and the Alcazar. Photo: Gerry Dawes©2011 / gerrydawes@aol.com. This morning most of us will tour Toledo and see the sights, including El Greco's home, then in late morning, we will all go to the cigarral and finish preparing the pig feast for the press and invited Spanish chefs and culinary luminaries. After lunch, we will load up and travel for about 45 minutes to the enchanting city of Chinchón, where we will check into our charming hotel just a block from Chinchón’s legendary Plaza Mayor, one of Spain’s best restored and loveliest plazas, which is like a page out of the 16th Century. We will relax a bit, perhaps have a world-class gin-and-tonic then have dinner overlooking the charming Plaza Mayor, whose romantic restaurants offer classic Castillian dishes, including more pig of course, but with the option of having wood-grilled steaks, bean dishes, fried potatoes with “broken eggs” and other specialties. We can linger over a glass of local Madrid D.O. wine or the town’s famous Anis Chinchón liqueur, watch the peregrinations of the people down in the plaza and reminisce about the high points and comedic episodes of our trip to the great pork regions of Spain. A glass of local garnacha rosado wine served with huevos rotos con patatas (fried eggs "broken" over fried potatoes) at La Balconada restaurant, overlooking La Plaza Mayor of Chinchón. In the morning our bus will take the tour members to Madrid Airport for the flights back home.